The cash flow quadrants are (E) for Employee (who usually look for security and benefits without taking any risks and by that they think they are safe. The E works for the system), (S) for Self Employed (They do everything by themselves and don’t like to depend on others because they think that they are the best. The S is the system), (B) for Business owner (they usually surround themselves by smart people and delegate work for them. The B creates, owns or control the system) and (I) for Investor (who makes money with money. They don’t have to work because their money is working for them. The I invest money into the system). Poor Dar said: – I’m not interested in money, I will never be rich, I can’t afford it, Investing is risky and Money is not everything. 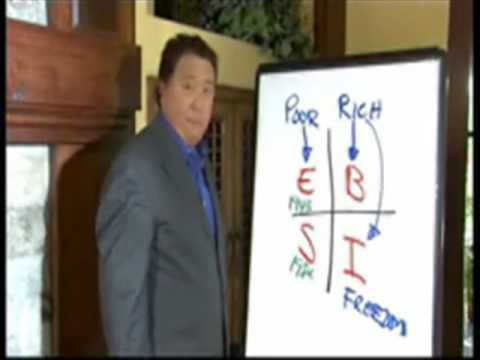 While Rich dad said: – it’s foolish to spend your life working for money and to pretend that money is not important. Rich dad believed that life is more important than money so you need money in order to have time for yourself and family to enjoy life and to spend some time with your kids. Anyone can change quadrants but changing quadrants is not like changing jobs or changing professions. Changing quadrants is often a change at the core of who you are, how you think, and how you look at the world. The change is easier for some people than others simply because some people welcome change and others fight it. And changing quadrants is often a life-changing experience. Not only you will change but so will your friends. While you will still be friends with your old friends. Many people can make a better hamburger than McDonald’s but who can make a better system then McDonald’s. Success is a poor teacher; we learn the most about ourselves when we fail so don’t be afraid of failing. Failing is part of the process of success. So unsuccessful people are the people who never fail. The hard thing about building a company from scratch is that you have two big variables: the system and then people building the system. Find a mentor not an adviser, the mentor is someone who has already done what you want to do while the adviser is someone who tells you how to do things but has not personally done it. A traditional way about learning about systems is to get your MBA from a prestigious school and get a fast track job up the corporate ladder. An MBA is important because you learn the basics of accounting and how the financial numbers are related to the systems of a business. Yet, just because you have MBA does not automatically mean you are competent to run all the systems that ultimately make up a complete business system. Working for a successful major corporation is like being paid by your mentor. To be successful, you need to learn to overcome your fear of being rejected, and to stop worrying about what other people will say about you. (What you think of me is none of my business. What is most important is what I think about myself). Anything important cannot really be learned in the classroom. It must be learned by taking action, making mistakes, and then correcting them. That is when wisdom sets in. What matter is not how much money you make, but how much money you keep, how hard it works for you, and how many generations you keep it for. You should learn how to see money by your brain not by your eyes. Most people struggle financially because they spend their lives using opinions rather than facts when making financial decisions. Opinions such as your house is an asset, the price of real state always goes up, Blue chip stocks are your best investment, it take money to make money, stocks have always out performed real estate, your should diversify your portfolio, you have to be dishonest to be rich, investing is risky, play it safe. You can always quit so why quit now? If you want to be successful then you need to control your emotions. Emotional Brain is usually 24 times bigger than the rational brain that’s why most of us take an emotional decisions rather than logical or professional decisions. People who are afraid of losing money do the same things in real life like people who stay in marriages where there is no longer any love, people who stay at dead-end jobs, people who hang on to old clothes and stuff they will never use, people who stay in towns where they have no future and people who stay friends with people who hold then back. When the fear of losing money comes up, most people’s minds automatically start chanting these words: security rather than freedom, avoid risk rather than learn to manage risk, play it safe rather than play it smart, I can’t afford it rather than how can I afford it, It’s too expensive rather than what is worth it long term, diversify rather than focus and what will my friends think rather than what do I think. To be successful in the B or I quadrant requires financial intelligence, systems intelligence and emotional intelligence. The six closest people that you spend the most time with are your future so you need to choose them carefully and wisely. If you want to learn something new then be prepared to be disappointed. Just as inside every problem lies an opportunity, inside every disappointment lies a priceless gem of wisdom. The reason there are few self-made rich people is because few people can tolerate disappointment. Instead of learning to face disappointment, they spend their lives avoiding it. Many people will not head down the street until all the lights are green. That’s why they don’t go anywhere. Your boss’s job is to give you a job. It’s your job to make yourself rich. Take action, believe in yourself and start today.